The One & Only Palmilla in Cabo San Lucas is a resort hosting the Jack Nicklaus designed Palmilla golf courses, as well as many other activities. You can read more reviews, and get hotel and airfare deals here - One & Only Palmilla reviews and vacation deals. This is a High end Cabo San Lucas resort, and that is reflected in the price of everything. The service is excellent at the Palmilla, sometimes a bit too excellent. There's no waiting around for a butler to be free, or a pool boy, they're there all the time ready for your next order. You have other little extras as well like I-pods to listen to when sun tanning at the pool. When you leave the pool and re-enter your room even the fruit has been changed in the bowl. Golf carts are there to take you around the resort. You are on vacation after all so relax while you take in the scenery, while being driven between your activities. One thing to note is the service is already on the bill. Dining at the restaurants at the resort will of course be expensive. When visitors can afford to stay at a high end resort like this they tend not to be the type that goes downtown for dinner. The service here is second to none, and that is what you are on vacation for. Be pampered, and make the most of it during your stay. The Palmilla private beach is the only one where it's safe to swim in the area. Practically deserted it will give you the peace that you don't get at the Madano beach. You have two pools. One is for everyone to enjoy, and the smaller one is for adults only. Both of them are infinity edged for that extra class. You will have to get up fairly early to get your sun lounger by the pool. This is by about 9.00. The hotel also has a rule that loungers that have been unattended for an hour will be given to someone else. All courses have five sets of tees. This gives a challenge to every level of golfer. Get a body numbing four-hands massage at the hotel spa. Just the right thing to do after a few rounds of golf to loosen your shoulders. 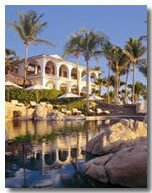 Your vacation at the One & Only Palmilla in Cabo San Lucas is one of pure luxury. The service there is by far some of the best in Cabo San Lucas, and you would expect it as well for what you are paying. You will get the chance to see a few famous faces as some often frequent the resort. From the moment you get picked up at the airport in your chauffeur driven Hummer you are pampered more than you want, or need to be.